Lightning-fast and built to last, 3D XPoint/Optane finally struts some of its stuff. Some people get their PC kicks from gaming, some from watching high-resolution multimedia, other from balancing the books (go figure). Us? Give us an SSD that measures performance in gigabytes per second. 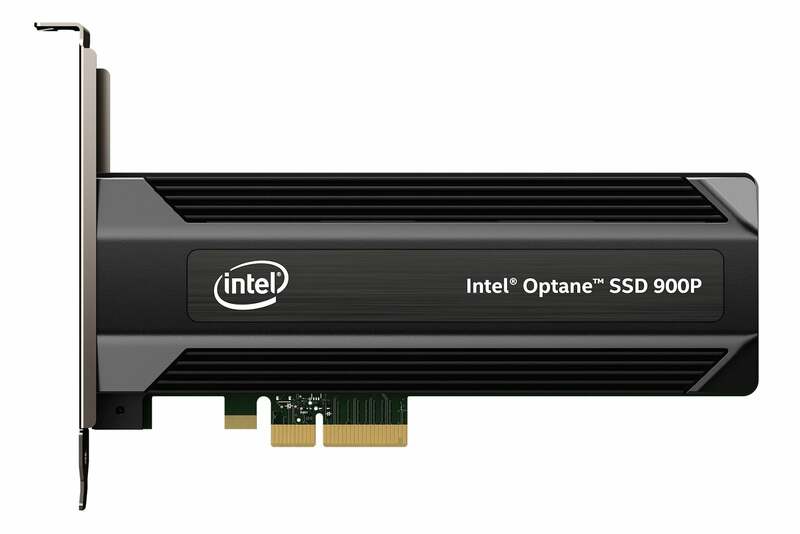 And if you want to make our Saturday night, give us a drive like Intel’s new blazingly fast Optane SSD 900P that delivers over 500,000 IOPs (small input/output operations), rather than the normal 100,000 or so. To heck with dinner and a movie! 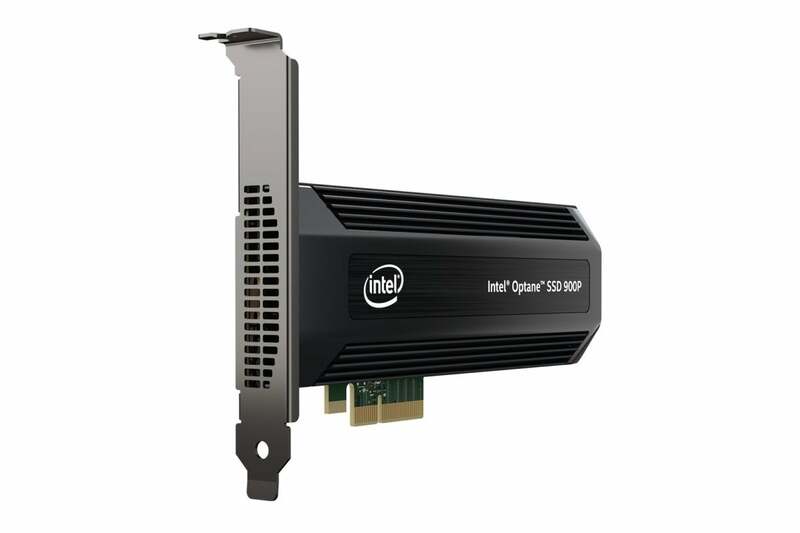 When a company markets pricey entities such as the Optane SSD 900P ($389 for 280GB or $599 for 480GB) to the enthusiast market, looks can help close the deal. Not that Intel’s silver-hued 750 and P3608 were ugly ducklings, but the all-black, silver-detailed SSD 900P looks aggressive and virtual-combat ready. The heatsink/case isn’t as bling-y (yes, it’s a word... to us), as say the Plextor M8Pe or the Apacer Commando, but it looks meaner. As mean as its performance. You can compare other drives we've tested in our comprehensive roundup of the best SSDs. The Optane SSD 900P certainly isn’t going to embarrass you when residing in your gaming rig. By our lights, it’s one of the best looking PCIe SSDs ever. While there’s a 2.5-inch version available, Intel sent us the 480GB x4 PCIe-card. The drive uses the NVMe protocol, so if you’re system can’t boot from that, don’t bother. Actually, scratch that. Bother to buy a new system. The hype about the 3D XPoint memory used in Optane storage products is that while it's non-volatile like NAND, retaining data without external power, it can perform like DRAM. Heady, game-changing stuff. Alas, the first Optane product we saw, the caching memory card released earlier this year, was a complete snooze-fest—reading like an NVMe SSD but writing little faster than a SATA SSD. Were the claims mere fantasy? Were there unforeseen technical glitches? Whatever the reason, we and everyone else were singularly unimpressed. That was then, this is now, and thanks to the SSD 900P, we’re getting a glimpse of what might be possible with Optane/3D Xpoint. 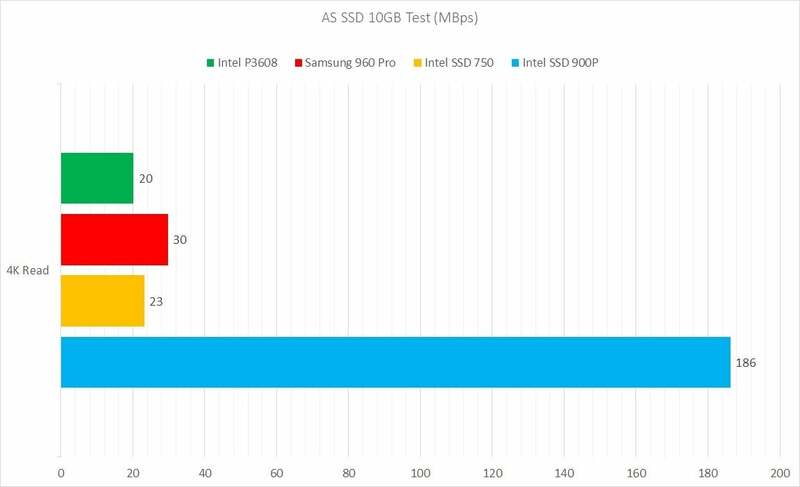 The Optane SSD 900P plowed through our tests almost as if they weren’t there. Having allotted an hour for the process, we were left wondering what to do with the remaining 45 minutes. 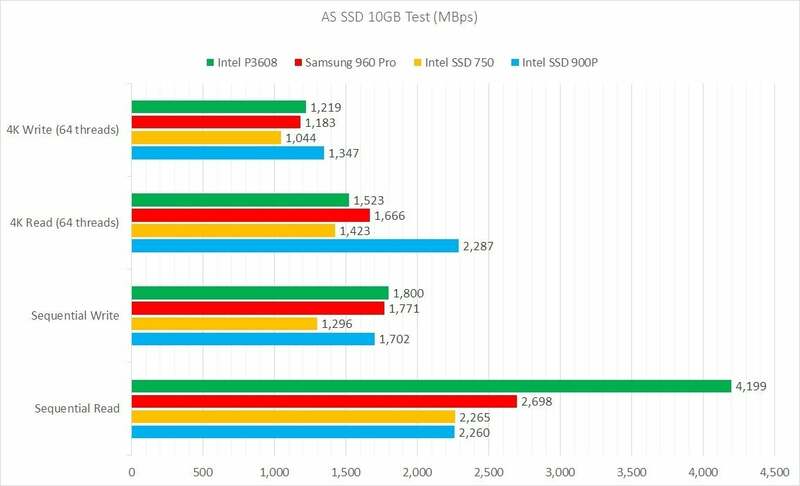 The AS SSD benchmark rated the drive at 2,287MBps reading and 1,702MBps writing. As you can see below, that’s not quite the fastest we’ve seen, but it’s darn fast. Yet sequential throughput is only part of this drive’s story. AS SSD issues the FUA command to bypass caching, which, if a drive heeds it, shows us the true capabilities of the memory on board. Intel tells us that the drive indeed acknowledges FUA, so what you’re seeing below should be raw 3D XPoint. Forget the Intel P3608 score—that’s two NVMe drives running in RAID 0. The 900P is clearly a force to be reckoned with—most especially with smaller files. The 900P’s low-queue 4K reads (below) were the real eye-opener—literally 6 times faster than the closest competitor. This can be a major advantage if you're running a program that keep lots of small files open, opening all those small config files when you first boot your operating system, or feeding something like a video encoder. The Intel SSD 900P holds a six-fold advantage over its closest rival when reading small files. CrystalDiskMark had basically the same thing to say about the Intel Optane SSD 900P that AS SSD did: very good sequential throughput and supremely fast small file reads. 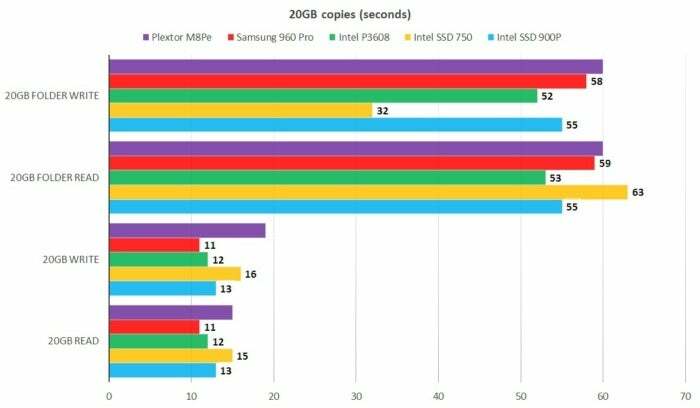 Though the Samsung 960 Pro outpaces the Intel Optane SSD 900P with sequential writes, it’s simply not in the same league with un-queued small file reads. In our real-world copy tests, which we use to verify the results of the synthetic benchmarks and spot inconsistencies, it took the Optane SSD 900P 13 seconds to read a 20GB file, and the same amount of time to write it. Writing a 20GB set of smaller files and folders took 55 seconds, and 58 seconds to read them back. That’s faster than most (though not quite all) of the competition. But most of the small files and folders we copy aren’t nearly as tiny as those used by the synthetic benchmark. Some of the first files that we copy are, and with them we noticed write speeds of 20MBps to 24MBps, where we’ll usually see 17MBps to 19MBps. 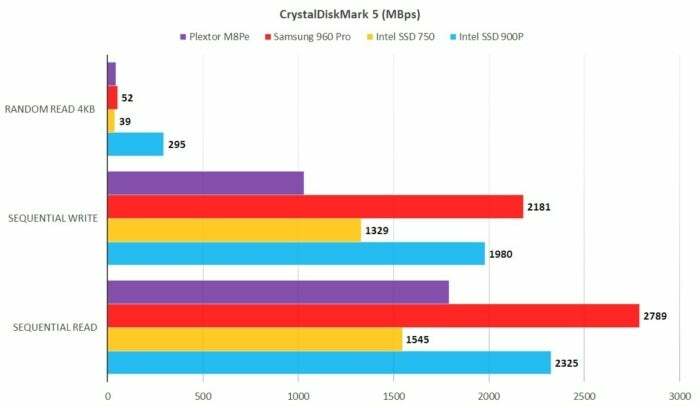 Though not the fastest at everything (the Intel 750 folder write score is an anomaly we’re still puzzling over), the Intel SSD 900P is clearly a fast drive. According to Intel, there should be a noticeable system-wide improvement in performance. We’re sure there will be improvements in OS boot times, multi-tasking, and task-switching. How noticeable, we can't say until we've spent more time with it. But performance is only part of the story. The Intel Optane SSD 900P has another trick up its sleeve, and for those worried about their SSD wearing out—it’s a doozy. While 3D XPoint memory hasn’t delivered the promised DRAM-like speed yet, Intel is pretty confident in its endurance. The 480GB Optane SSD 900P we tested is rated for an absolutely ludicrous 8,750TBW (TeraBytes Written), or 8.75 petabytes. That makes the the 200TBW or so similar capacity NAND-based SSDs are rated for seem paltry. For all intents and purposes, if the predictions are correct (Intel actually says “up to 8,750TBW”), the SSD 900P is immortal. At least in terms of the technological ecosystem it inhabits. We should point out that even the far lower TBW ratings of NAND SSDs provide the same practical "immortality". Two hundred terabytes is more than the current average user is likely to write in a decade, at which point, the drive will likely be obsolete. All that said, with 4K and ever-increasing bandwidth available, we'll take the 8.75 petabytes. If you want the best storage for your consumer PC—the Intel Optane SSD 900P is it. When you factor in longevity, nothing else even comes close. The SSD 900P is good-looking, fast, and likely to out-last the system you put it in. But the Optane SSD 900P is expensive. In terms of bang-for-the-buck you can get roughly the same subjective experience for about half the dough with a garden-variety PCIe/NVMe SSD. Most consumers should seek just that. And did we just say garden-variety PCIe/NVMe? Man, things have come a long way in the storage world. We can’t wait to see whether Optane/3D XPoint really can match DRAM speed and knock down the barriers between storage and main memory. As promised. 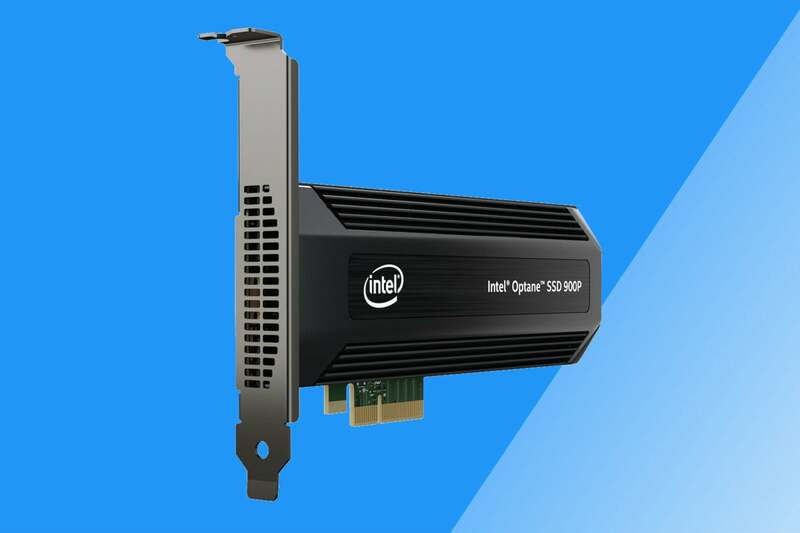 If you want the fastest, longest lasting storage for your PC, Intel's SSD 900P with its Optane memory is it. It's especially faster with applications such as video and audio content creation and editing that can thread multiple writes.